What Should You Look for in a Hog Roast Specialist? Have you ever attended a professionally-catered hog roast? Maybe you’ve even organized such an event at some point in the past. It’s a hugely popular catering option, and this will continue to be true for a long time. Part of the appeal of a good hog roast is the festive atmosphere it creates. People love gathering around a whole roast hog and anticipating the delicious flavors they’ll experience. It’s a favorite way to celebrate special occasions, such as birthdays, weddings or corporate functions. But let’s be honest – not all hog roasts are the same. There are those that exceed expectations in every way and deliver across the board regarding the quality and the overall experience. And there are those that leave a lot to be desired. Hog roasting is an art that goes way back into history, and although technology has changed, the art of roasting a hog is still something that takes time and skill to master. Let’s say you’re organizing a hog roast for an upcoming event, and you’re wondering how to go about choosing a specialist. Where do you begin? What should you look for? These are necessary questions to answer if you want to get the most out of your event. The first thing that you should pay attention to is an experience – and not just with catering in general, but with hog roasting in particular. You don’t want a catering company to be “learning” the art of the hog roast on your time. You want someone who has already mastered the hog roast and is prepared to deliver a result that goes beyond what you expected. That means finding a caterer who regularly handles hog roasts throughout the year, in a variety of settings. Experience is a hugely important attribute when it comes to hog roasts. Professionalism and service are also high on the list – this is relatively obvious. You need a company who is clean, professional, courteous, and punctual. The hog itself probably isn’t the only thing you’ll be relying on this company to provide, so you’ll want to make sure that the entire menu is carefully curated and customised to your event. 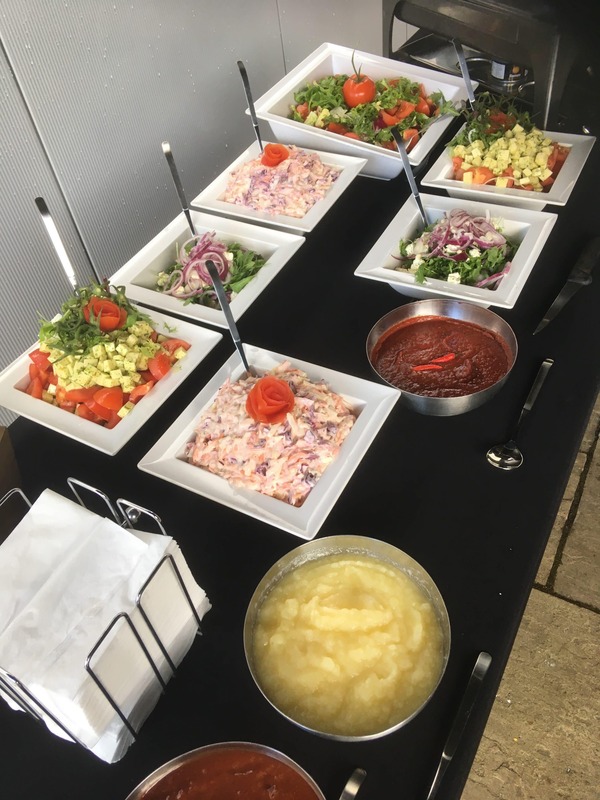 Caterers with a high degree of professionalism are concerned first and foremost about customer satisfaction and making sure the event itself is a success. That means working carefully with each client to make sure that expectations are not only met, but exceeded. Those companies who do a lot of hog roasts – and do them successfully – are going to be the most reliable prospects for your hog roasting event. It’s also important to know precisely how the hog will be roasted. In the vast majority of cases, the hog is roasted off-site and “finished” at the event, meaning the hog is already roasted by the time it arrives. This is due to logistical constraints involving the time needed to roast a hog – but a professional will make sure you know exactly what you’re getting ahead of time, to avoid misunderstandings. Overall, you should be able to trust your caterer to make it a memorable and smooth experience, from start to finish! See our menus here.